ATTACK OF THE KILLER TOMATOES has long been a cult classic and nothing I write will do much to change that—nor should it. 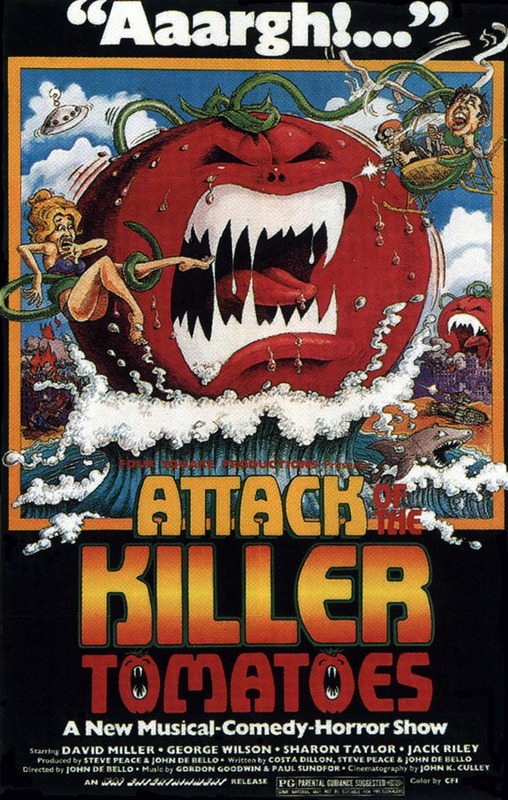 I was first introduced to the killer tomato motif, shall we say, as a kid when I came across a Saturday morning cartoon spin-off of the original movie. I did not understand at the time why there were these talking, anthropomorphized tomatoes running around, but this did not trouble me. After all, was it really so far-fetched as talking, anthropomorphized, turtles who received ninja training from a rat? Kids, I am convinced, are idiots, albeit blissful ones. Now, some 15 odd years later, I’ve finally seen the source material (itself inspired by the source material of shlock sci-fi films). AKT does some things very well and others very poorly, perhaps explaining why it has over the years received such mixed reviews. Some swear by its humor, others consider it far overrated. I fall somewhere in between. ATK has some good jokes, to be sure. The opening of the film plays very well, perhaps because the idea of killer tomatoes is at its most novel. I laughed out loud when two senior citizens calmly observed a giant tomato munching down on Little Timmy. Likewise, our introduction to our bulbous red villains is cutely funny (standard fair is for a tomato to be rolled into shot while a dubbing of chipmunk like noises is played). But ATK also tries to replicate the humor of films like AIRPLANE which, sad as this is to say, had far better—or at least more consistent—writing. Jokes about a Japanese scientist lost in translation are amusing as far as they go, but I’m left with the feeling of having seen better. In addition, the tomatoes themselves—arguably the film’s central gag—don’t hold up in the long run as they are never given much depth. The novelty of the idea wears off relatively quickly, but the tomato attacks continue throughout the film and successively lose their luster. Where the film shines most, in my opinion, were the moments which neither made me guffaw nor cringe, but rather sit and smile—much like a kid watching Saturday morning cartoons. Most successful are the musical numbers which interrupt the diegesis of the film while simultaneously continuing its narrative. Likewise a climactic crowd scene where the townspeople (dressed up in ridiculous costumes for no particular reason) finally make a stand against the tomatoic hordes. ATK tries to delve into satire, but this feels dated whereas the film’s occasional moments of zaniness consistently perked my interest. I guess the proper wrap up would involve the words ‘fresh’ and ‘rotten,’ but I’ll spare you. ATK is a cult classic for good reason. It does a lot of things wrong/right, and while I wouldn’t spend much money on it, it’s worth the watch should you come across it.